Tiny homes are a trend that's not stopping anytime soon. For most Americans, a third to half of one's income goes towards owning a home, typically through the payment of mortgage over time. Pretty soon, just keeping pace with one's current lifestyle and owning a house begins to feel like a trap. The majority of tiny home owners are drawn to these 1,000-square-foot homes for the freedom it provides. Gone are the days of owning a mortgage, having a mountain of debt, and feeling like you are forced to work to keep up. You can choose to build your own tiny home and own your home outright. On top of it, you can enjoy the freedom of choice. Your monthly bill decreases substantially as you are no longer needing to do substantial home maintenance work. 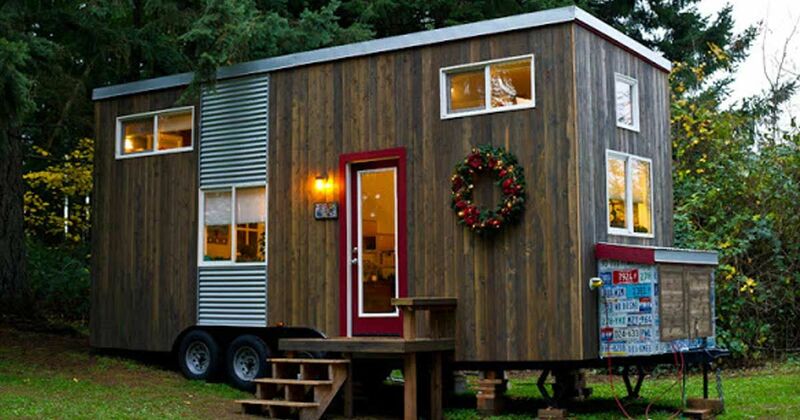 This enables many tiny home owners to not have to work full-time. Instead, they can travel more and spend extra hours on new hobbies or with loved ones. 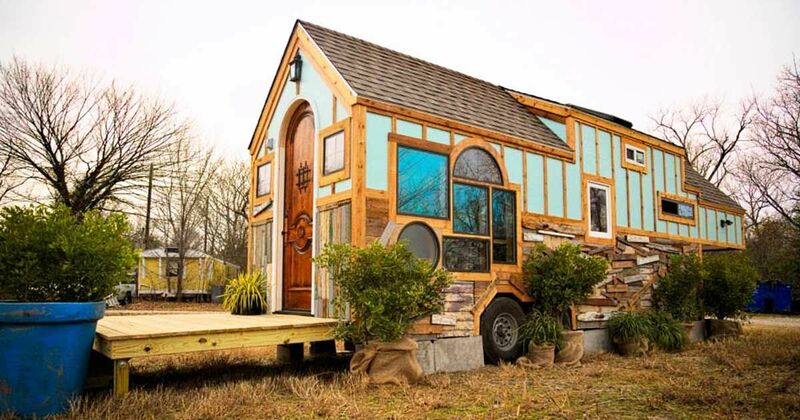 There are many tiny homes out there, and you can decorate them in virtually any style. Tour everything from tiny homes with the most rustic interiors to tiny homes with the brightest interiors. In the list below, we've compiled the top tiny homes with the best shabby chic interior looks. Shabby chic means the interior furnishings usually feature more distressed, antique decor. Some of these homes mix shabby chic with modern; others mix shabby chic with rustic. Regardless, if you like to bring some vintage touches into your home, you must take a tour of the homes below. Kim Lewis is the founder of Kim Lewis Design in Austin, Texas, and Los Angeles. Lewis, known as "The Vagabond Designer," has taken to designing buildings that speak to clients' "roots, . . . wings . . . and purpose." One of the byproducts of her new designs is the home below, designed for the co-founders of Window to the Wild. Co-founders Lindsey and Simon McNeny train wildlife so that people can interact with it and develop a love and respect for it. They incorporate interactive wildlife displays into man's concrete jungle in an attempt to create an increased awareness of the wildlife constantly surrounding mankind. The McNenys hired Lewis to design a tiny home for them that reflected their love for wildlife and birds. The end result is "The Perch" in Texas. Get the full tour here. The photos speak volumes. The couple, by appearances, live a free and easy existence that is in constant motion -- making trips to Europe, South America and other ports of call. But their tiny house lifestyle is also a statement. If tiny house living means jettisoning your greed for stuff, then how much freedom does that allow? The couple with their bright-eyed pet dog Salies seem like they are on the road to figure that question out. Let's see if their cozy home, which they built themselves, allows for that. Get the full tour here. 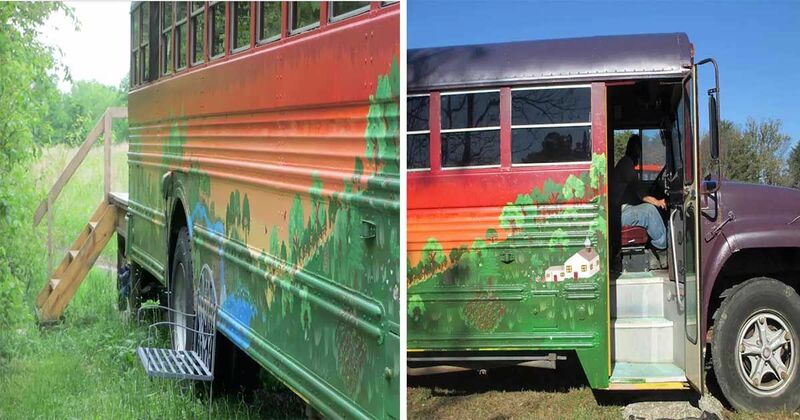 Parked in the heart of the Shawnee National Forest in Illinois, this charming, hand-painted school bus is a cozy retreat from the busy world outside. Go off the grid inside this completely solar-powered cabin-style conversion and enjoy the peace and quiet of the wilderness. With plenty of room for three to sleep, this wood-paneled bus overlooks the most scenic lake, where you can canoe by day and enjoy a sky full of stars at night. You may catch glimpses of some of nature's creatures as you walk along the forest and trails. Leave the city behind and immerse yourself in a rustic existence for a weekend, and return home feeling refreshed and invigorated. As you walk into the bus, you'll feel how inviting the space is and want to settle in for the night. The ceiling and interior are created from hand-milled pine. Get the full tour here. Vacationing in RVs have been apart of America's travel traditions for decades. While the first motorized camper was developed in the early 20th century, the popularity of travel trailers grew exponentially in the 1950s and 1960s. Just as other architectural developments, trailers began to focus more on interior design and comfort rather than strict functionality. While this Red Dale Coach travel trailer was manufactured in 1973, its owner wanted to pay homage to classic midcentury design and 1950s popular culture whilst renovating her home-on-wheels. 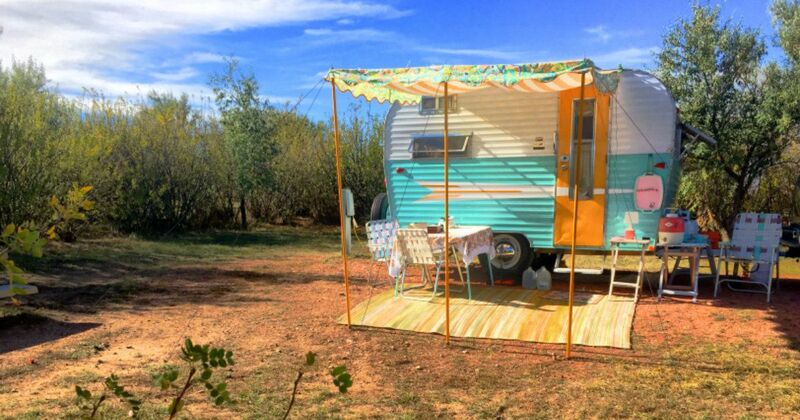 The result is a brightly colored, absolutely adorable, and infinitely comfortable trailer named Myrtle. Get the full tour here. 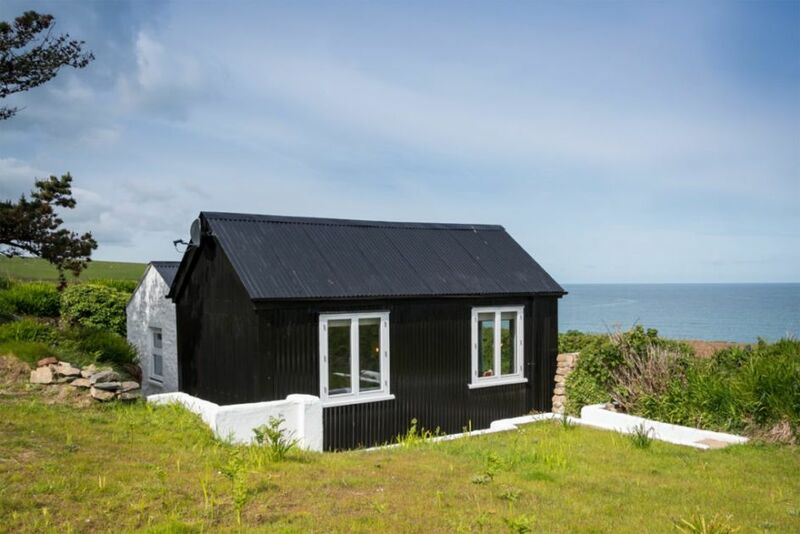 The unique black-and-white exterior of this seaside cottage is just the beginning of the home's amazing style. The house, overlooking a beach in South Wales, was originally built to hold the first telephone lines being laid across the Atlantic Ocean. Now a vacation rental from the portfolio of Unique Home Stays, it has been charmingly dubbed the Cable Hut. The current interior design is obviously inspired by the home's industrial origin. Light fixtures with exposed Edison bulbs, a wooden cable reel table and black iron furniture all create a nod to the past. Traditional cottage style is mixed in with the industrial decor, creating a unique and cozy space where lack of square footage is never a problem. Get the full tour here. The simplicity of a log cabin lifestyle is rooted in the ancient Greek philosophy of Stoicism: A belief in living in harmony with nature, free from the distractions of desire. Almost accidentally, this lifestyle was adopted by the United States of America, where the forefathers of settlement times naturally lived a peaceful existence without trinkets, connected to the awesome might of the ever-abundant countryside of the U.S. Get the full tour here. M. J. Boyle's tiny home journey is unlike any other. In a touching letter on her blog "My Empty Nest," Boyle tells exactly what tiny living means to her. 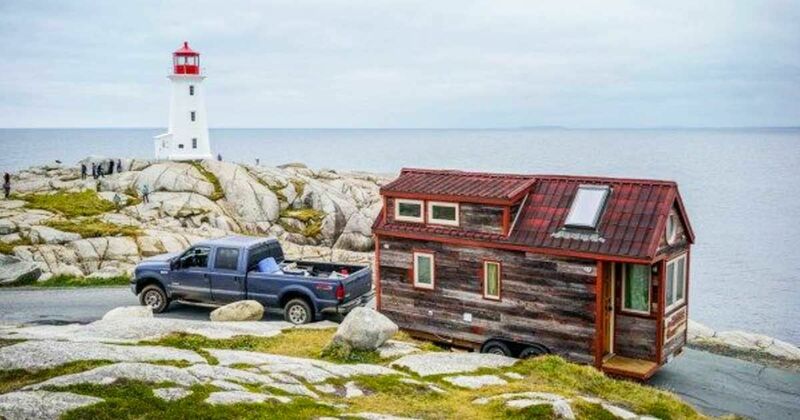 She had moved and built her own tiny home after her two kids grew up and moved away. Get the full tour here. The Campwoods Grounds is a unique community located in the historic village of Ossining, New York. Once a Methodist summer revival camp, it is now the full-time home of about 45 families. 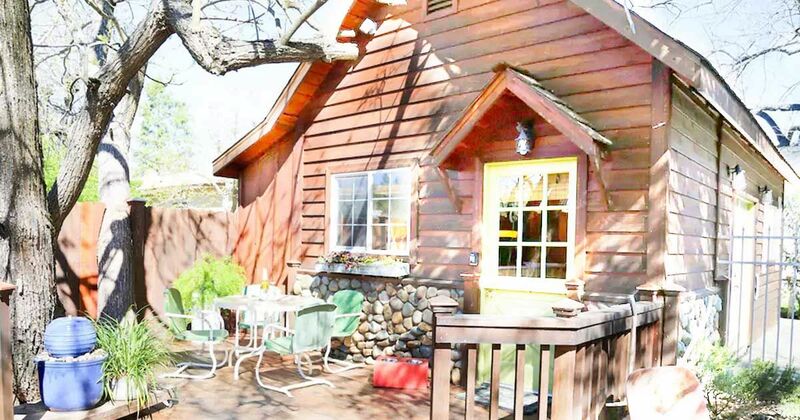 The summer cottages have been converted to permanent residences, and this "Campwoods Cutie" is one of those homes. The cottage is 850 square feet and has two bedrooms, one full bath and one lavatory under the stairs. The floor plan also squeezes in a living room, dining room, kitchen and tea room. Surrounded by trees and with views of the nearby babbling brook, the charming house is a true sanctuary. Get the full tour here. 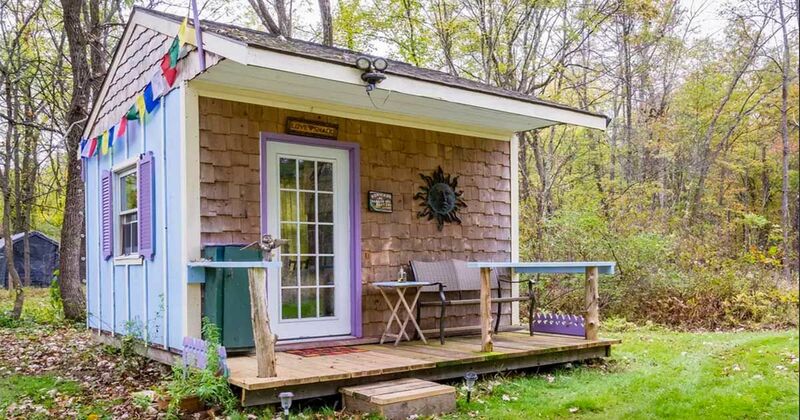 It might look a little like the candy house in Hansel and Gretel, but this charming tiny house in New York State is the ideal spot for nature lovers seeking a little weekend getaway replete with close-by hiking opportunities. It also is a gorgeous spot for people who love being ecologically respectful of the surrounding area. 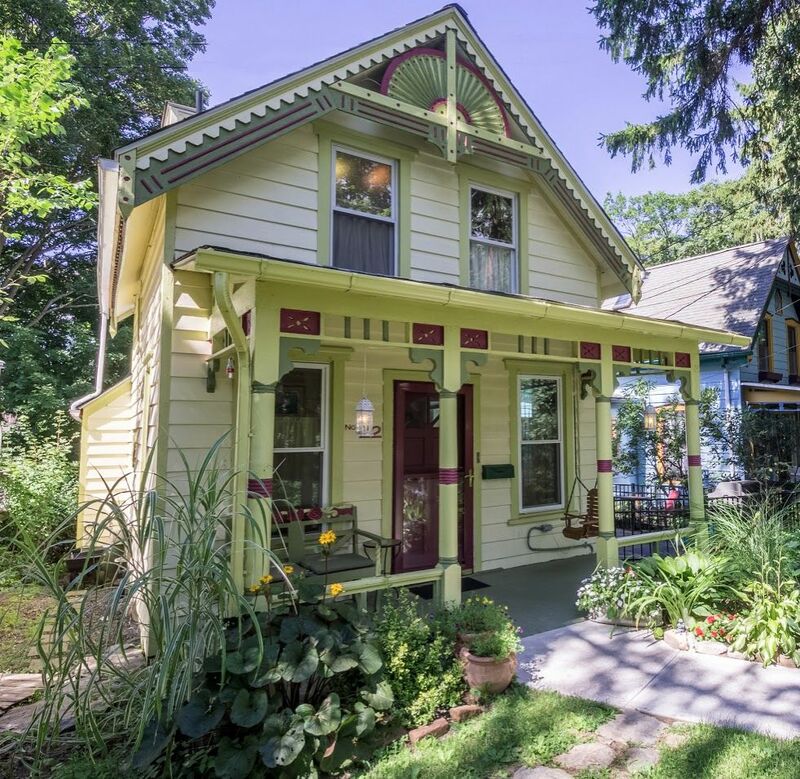 With purple trim on the shutters and doors, this tiny house is truly bigger than it appears, with a charming front porch featuring a comfortable bench for two and a side table perfect for placing drinks while enjoying the cool summer nights, when temperatures settle in the low 60s. Get the full tour here. 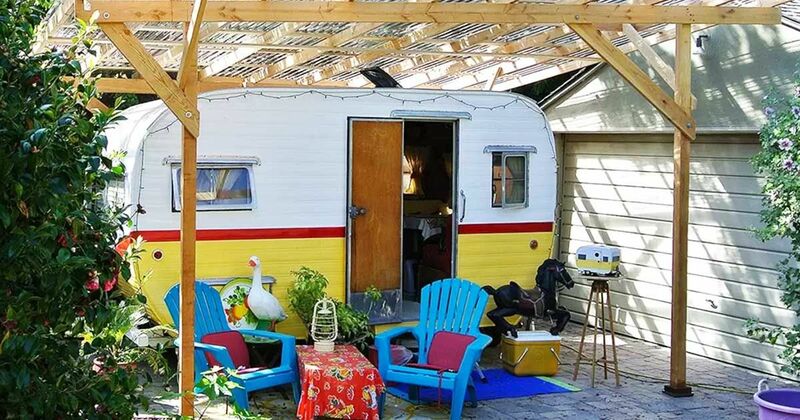 Decked out in vintage decor, this tiny Menlo Park, California trailer is the funky little retreat you've been searching for. There's quirky quilts, original cabinets, wood panels and mustard yellow accents that bring you back to the 70's. If that wasn't enough to make it cozy - this trailer is a very compact size. If you get tired of lounging in the full sized bed, or chowing down at the dinette you can also head outside. There, you'll find lounge chairs, a pergola, and the perfect little patio to sit around and enjoy all that California weather. Take the tour and enjoy this tiny trailer for yourself. Get the full tour here. The Little Log House Company draws inspiration from fairy tales, and their sense of wonder makes this teeny 296-square-foot cabin all the more appealing. The Gate Lodge model, version 1A (there are three different varieties) features a gated porch and balcony to set it apart from other cabins. 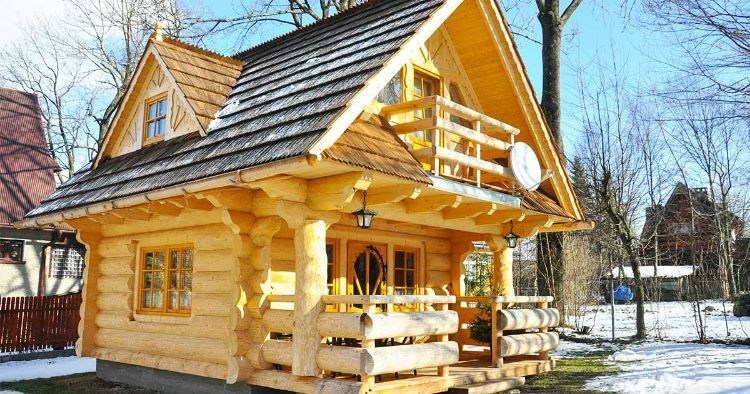 Like all the homes from The Little Log House Company, the Gate Lodge was handcrafted with high-quality large semi-round logs and rustic timber floors. Their dedication to using "Historic Log Building Methods & Style" and quirky detailing imbues each home with feelings of both nostalgia and magic. Get the full tour here.